A turtle ship replica at the military museum in Seoul. A Turtle ship was a large warship belonging to the Panokseon class, used by the Korean navy between the fifteenth century and eighteenth century (also known as Geobukseon or Kobukson, by its Korean name). It won fame for playing a vital role winning sea battles against Japanese ships during the Japan's Korean War (1592-1598). Faced by a determined foe, Hideyoshi's invading navy and army, Korea had little to oppose him with. The Korean army lacked the forces and leadership to stop, let alone defeat, Japan. On to this scene appeared a hero whose exploits on the naval battle grounds have earned him the love of his country man and the respect of his foes. He redesigned a Korean warship and renamed it the Turtle ship. That ship, coupled with Admiral Yi Sunsin's leadership and his sailors skill, proved the deciding factor in preserving Korea's independence at the end of the sixteenth century. Contrary to public belief, however, the mainstay of the Korean navy in the war remained the panokseon warship. The first references to Turtle ships come from 1413 and 1415 records in the Annals of the Joseon Dynasty. Described as "spear-ships" or "ramming ships," the navy employed the turtle ships mainly to thwart Jurchen and Japanese pirates. The early turtle ships soon fell into disuse, though, during a long period of peace that Korea enjoyed. Popular accounts credit Admiral Yi Sunsin with designing and building the craft. Actually, Admiral Yi redesigned the Turtle ship which existed long before the late 1500s. He equipped the Turtle ships with at least five different types of cannons during the Japan's Korean War (1592-1598). According to Nanjung Ilgi, one of Admiral Yi's personal diaries, he decided to resurrect the turtle ship in 1591, after discussion with his subordinates, thinking of possible foreign invasions. With their help, Yi constructed the first modern turtle ship. The admiral's diary, along with a book entitled, Hangrok, written by his nephew, Yi Beon, described the details about the structures, construction progress, and use of turtle ships, as well as testing of weaponry used in the ships. After a year of research and construction, Yi and his sailors completed the first modern turtle ship. Launched on March 27, 1592, the Turtle ship boasted mounted cannons with gunnery ranges of from 300 to 500 meters. They tested the cannon on March 12, 1592, one day before the Siege of Busan and the Battle of Tadaejin. Several different versions of the turtle ships served during the war, but in general they were about 100 to 120 feet long (30 to 37 meters long), and strongly resembled the panokseon's bottom structure. Technically, a hull placed on top of a panokseon, a large anchor in the front of the ship, held the turtle ship in place. A dragon head mounted n the bow of the vessel emitted foggy sulfur gas to effectively throw the enemy fleet into disarray, as well as to hide the ship itself as it approached and maneuvered among enemy ships. The dragon head housed a cannon inside as well. The dragon head, both fuming fire and shell, served as a form of psychological warfare in shocking Japanese soldiers. A large anchor securely fastened to the front of the ship served as a ramming weapon. To add to the terror, artisans painted a "face" below the anchor. Like the standard panokseon, the turtle ship had two masts and two sails. 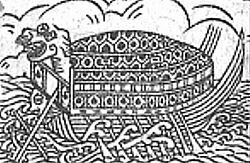 Like the panokseon, the Turtle ship used oars to enhance speed. That provided an advantage to the Korean fleet over the Japanese ships relying solely on the wind to move. The turtle ship could turn within its own radius, providing another major advantage over their Japanese opponents. The turtle ship had ten oars and eleven cannon portholes on each side. One cannon fired through porthole in the dragon head's mouth. Cannons fired through two more portholes on the front and back of the turtle ship. The heavy cannons enabled the turtle ships to unleash a mass volley of cannonballs. Fifty to sixty fighting marines and seventy oarsmen, as well as the commander, comprised the crew. Hexagonal plates with sharp iron spikes protruding from them covered the upper half of the turtle ship. The closed deck protected the Korean oarsmen and sailors from arquebus fire and arrows, providing another advantage over the Japanese. The crew set spikes to discourage Japanese sailors from boarding the ships as the primary Japanese method of naval combat at that time involved grappling an enemy ship with hooks and boarding to engage in hand to hand combat. Korean written descriptions all point to a maneuverable ship, capable of sudden bursts of speed. Like the standard panokseon, the turtle ship featured a U-shaped bottom hull which provided the advantage of a more stable cannon-firing platform and the ability to turn within its own radius. The U-shaped bottom of the Turtle ship had the disadvantage of a slower cruising speed than the Japanese ships with V-shaped bottoms. Contrary to popular belief, only three to six turtle ships were commissioned into the Korean Navy during the period of Hideyoshi's invasions of Korea; the panokseon warship, roughly the equal size to the turtle ship, served as the mainstay of the Korean Navy. Building Turtle ships required heavy resources. In a painting found in a Japanese castle, Japanese artists depicted the Turtle ships as three-storied mammoths, as large as modern ships. Troops took their stations on the first floor, archers on the second floor, with cannons positioned on the third floor. Numerous handles throughout the ship appear to release water and suppress any fires on board. Historians maintain that many weapons and functions found in the painting existed years before other nations developed them. Yi Pun, nephew of the admiral and witness of the war, mentions briefly in his biographical record that the upper part (roof deck) was covered with planks studded with bladed spikes, but gives no further details concerning the materials used. …About 8 o'clock in the morning the enemy fleet (Yi Sun-sin's fleet), composed of 58 large ships and about 50 small ships, began to make an attack on ours. Three of the large ones were blind ships (turtle-boats) covered with iron. Toyotomi Hideyoshi had a written request sent to Tokugawa Ieyasu for iron plating to help "counter" the Korean navy. Some interpret this to be evidence of iron cladding on the turtle ships, but it may simply be a reference to the need for better Japanese vessels to counter the Korean ships. The only contemporary depiction of the Turtle ship, the one commonly referred to as the first picture, comes from the Complete Writings of Admiral Yi, edited for the first time two hundred years after the war, in 1795. The brushwork departs in important aspects from the war records: While the hexagonal structure of the deck may give credence to the view that the turtle ships featured iron roof plates, the unexplained absence of the documented iron spikes have raised doubts, leading to complaints about the "lack of realism in the brushwork of literati" which "has introduced questions as to the authenticity of the records". Also, near the end of the nineteenth century, under the threat of the French navy, Korea officially commissioned the building an ironclad ship "just like the turtle ship." The official's design of the ironclad ship proved, however, too heavy and failed to float. A drawing from 1795 of Admiral Yi's turtle ship shows a distinctive hexagonal pattern, strongly implying that something has been laid out over the wooden planking. The iron-cladding of the turtle ship, if it existed, arose from vastly different fighting techniques than that of the nineteenth century ironclad. While the ironclad featured armor covering the sides, and later also all around, to protect the vessel from enemy shells, the iron roof of the turtle ship served the function of preventing Japanese soldiers from boarding. The dragon head protruded at the top of the ship at the bow. the turtle ships sported several different versions of the dragon head. The dragon head first placed on the Turtle ships served as an early form of psychological warfare to shock Japanese soldiers. One version carried a tube which could release a dense toxic smoke generated from a mixture of sulphur and saltpetre produced in the bowels of the ship. The Korean navy designed the smoke to obscure vision and interfere with the Japanese ability to manoeuvre and coordinate properly. Another version of the dragon head had a cannon placed in its mouth so that the ship would appear to be more threatening. Admiral Yi's own diary explains that a cannon fit into the mouth of the dragon fired at enemy ships. The iron spikes used on the turtle ship prevented the Japanese from boarding by piercing their feet when they attempted to board. Admiral Yi often covered the spikes with empty rice sacks to lure the Japanese. Iron armor, and the entire "shell" of the turtle ship, protected sailors and rowers from both cannon and arquebuses, unlike the panokseon battleships. The cannons provided the main advantage of the turtle ships over the Japanese ships, since cannons enabled the turtle ship to destroy an enemy ship at a distance. The turtle ship, like the standard Panokseon, could carry around thirty cannons. Eleven gun ports on each side and two gun ports on the front and back bestowed enormous firepower upon the Turtle ship. Several different versions of the turtle ship included between twenty-four to thirty-six cannons. With the gun ports located all around the turtle ship, the ship could fire in any direction. The turtle ship carried Chon (Heaven), Ji (Earth), Hyun (Black), Hwang (Brown), and Seung (Victory) cannons. The Seung, the lightest cannon, ranged 200 meters, while the Chon, the heaviest cannon, had a range of 600 meters. The Hyun and Hwang cannons, both medium-sized, usually shot fire arrows instead of cannonballs. Yi resurrected the turtle ship as a close-assault vessel, intended to ram enemy ships and sink them, similar to their use in past centuries. Rowed directly into enemy ship formations, the ship disrupted their lines. After ramming, the turtle ship would unleash a broadside cannonball attack. Because of that tactic, the Japanese called the turtle ships the mekurabune (目蔵船), or "blind ships," because they would get close and seemingly blast and ram into enemy ships. The Korean navy employed the Turtle ships in that way during the Dangpo Battle, Battle of Okpo, and Battle of Sacheon (1592). The plating on the roof, along with the protruded spikes, served mainly as as an anti-boarding device. Grappling hooks failed to gain direct hold on the plating, and jumping to the turtle ship often meant being impaled. The iron plating also made destroying a turtle ship more difficult for Japanese ships, since cannons, arquebuse bullets, and arrows fired from above failed to damage the Turtle ship. The turtle ship spearheaded attacks or ambushed Japanese ships in tight areas such as in the Battle of Noryang. Despite popular depiction, the turtle ship moved relatively quickly. The turtle ship's oar propulsion combined with sails and relatively light weight, made for an agile craft. Admiral Yi constructed the turtle ship fast and agile for the purpose of ramming. Turtle ships have been reconstructed recently for commercial and academic purposes. 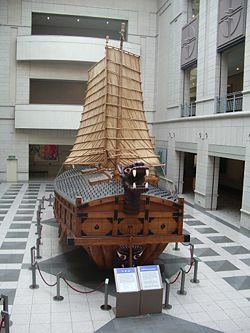 Keobukseon Research Center (거북선연구원), a private commercial company, has done much research on the original design of the turtle ship and made several real-size reconstructions of them for commercial use. They have been used in a Korean drama, The Immortal Yi Soon Shin (불멸의 이순신). Several museums display turtle ships and people can visit and go inside a 1:1 scale turtle ship anchored at Yeosu. Models of the Turtle Ship make popular forms of decoration and gifts. ↑ Hae-Ill Bak, “A Short Note on the Iron-clad Turtle Boats of Admiral Yi Sun-sin," Korea Journal 17:1 (January 1977): 34. ↑ Hae-Ill Bak, “A Short Note on the Iron-clad Turtle Boats of Admiral Yi Sun-sin," Korea Journal 17:1 (January 1977): 35. ↑ Stephen Sterling Turnbull, Samurai Invasion, p. 244. ↑ Keobukseon Research Center (거북선연구원), Home. Retrieved May 13, 2008. ↑ KBS Drama homepage, The Immortal Yi Soon Shin. Retrieved May 13, 2008. ↑ 우리살림,거북선 모형 조립키트(1:100). Retrieved May 13, 2008. Ballard, G. A. 1972. The Influence of the Sea on the Political History of Japan. Westport, Conn: Greenwood Press. ISBN 0-8371-5435-9. Hulbert, Homer B., and Clarence Norwood Weems. 1962. History of Korea. New York: Hillary House Publishers. Jho, Sung-do. 1992. Yi Sun-shin; a National Hero of Korea. Chinhae, Korea: Choongmoo-kong Society, Naval Academy. Park, Yune-hee. 1978. Admiral Yi Sun-shin and his Turtleboat Armada. Seoul: Hanjin Pub. Co.
Yi, Sun-sin. 1981. Imjin changch'o: Admiral Yi Sun-sin's Memorials to Court. Seoul: Yonsei University Press. Yi, Sun-sin. 1977. Nanjung ilgi: War Diary of Admiral Yi Sun-sin. Seoul: Yonsei University Press. Admiral Yi Sun-sin - A Korean Hero (includes clips from the drama Immortal Admiral Yi Sun-shin). This page was last modified on 24 December 2015, at 15:58.